Disney's The Lion King is to embark on a new UK and Ireland tour later this year, to coincide with 20 years of it being in the West End. The last tour ended in February 2015. The tour kicks off at the Bristol Hippodrome in September, and will visit Edinburgh Playhouse in December, with further venues to be announced. The Lion King premiered in London in October 1999 at the Lyceum Theatre and is now the sixth longest-running West End musical of all time. To celebrate 20 years in London more events are still to be announced. Simba begins life as a prince: son of the powerful King Mufasa, but his happy childhood disappears when his evil uncle Scar murders his father and drives Simba out of the kingdom.While in exile he befriends Pumbaa the warthog and Timon the meerkat and lives a carefree life in the jungle. But as he approaches adulthood he is visited by the spirit of his father who instructs him to go back and defeat the nefarious Scar to reclaim his throne. Songs include the hit songs "Can You Feel the Love Tonight" and "Circle of Life". Music by Elton John, Lyrics by Tim Rice, Book by Roger Allers & Irene Mecchi. Directed by Julie Taymor and Choreographed by Garth Fagan. 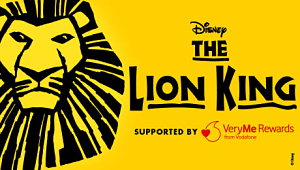 You can also book tickets for The Lion King in London which is playing at the Lycem Theatre in the West End.